Not to be confused with Herb Peterson. 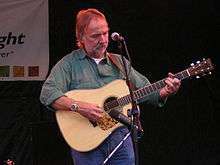 Herb Pedersen performing in 2004. Country, Bluegrass, Progressive bluegrass, Folk, Folk rock, Country rock. Sugar Hill, Epic, Reprise, Elektra, Atlantic, Rhino, Sony, Curb, MCA, Back Porch, Acoustic Disc. Herb Pedersen (born April 27, 1944 in Berkeley, California) is an American musician, guitarist, banjo player, and singer-songwriter who has played a variety of musical styles over the past forty years including country, bluegrass, progressive bluegrass, folk, folk rock, country rock, and has worked with numerous musicians in many different bands. Pedersen often performs with Chris Hillman, and both were once members of the Desert Rose Band. Pedersen also fronted his own band called the Laurel Canyon Ramblers. Besides this, Pedersen has also worked with the following musicians and groups: Mudcrutch, Pine Valley Boys, Michael Martin Murphey, Earl Scruggs, The Dillards, Smokey Grass Boys, The New Kentucky Colonels, Old and in the Way, David Grisman, Peter Rowan, Vassar Clements, Gram Parsons, Emmylou Harris, Skip Battin, Tony Rice, Dan Fogelberg, Stephen Stills, Linda Ronstadt, Kris Kristofferson, John Prine, Jackson Browne, John Denver, John Jorgenson, and Leland Sklar, among others. ↑ Ankeny, Jason. "Biography: Herb Pedersen". AMG. Retrieved 15 May 2010.